Employee engagement is a hot topic and for good reason. Engaged employees drive revenue, provide quality products and services, and create positive customer interactions. On the other hand, employees who are actively disengaged are estimated to cost the US economy roughly half a trillion dollars a year. This is because of factors such as lost productivity, employee time theft, and client alienation due to poor customer service. While no one debates how debilitating disengaged employees are, some organizations struggle with how to create employee engagement in the first place. Here are five tips for creating a workplace that fosters employee engagement. The first rule of medical diagnosis is, "Ask the patient where it hurts." Patients are often the best guides to help doctors determine what’s wrong and how to fix it. In like manner, the first rule of diagnosing employee engagement issues is to ask your employees how they feel and why. This accomplishes several goals. First, it lets employees know you care enough to listen to them. Demonstrating that you care goes a long way toward building loyalty and respect. Second, it provides a safe forum for employees to give feedback. Sure, some feedback will come across as petty and complaining, but the majority of it will point toward real opportunities to become a better more engaging organization. Employees have a responsibility to speak up to make sure that they tell their managers what they need to do their jobs well. Asking employees provides that opportunity. Third, by genuinely asking your employees what’s working for them and what isn’t, you create a culture of continuous improvement and constructive feedback—both keys to successful organizations. It's critical to report the survey findings after asking employees for their opinions. Transparency with the results is key to building trust in the process. Individual responses ought to remain confidential, but it's important to quickly share the aggregate results of an employee engagement survey with the company. Transparency of this kind engenders trust within the organization. Employees feel and are shown they have a voice when you ask them what's working for them and what isn't. They know you've heard them when you share the results openly. By your transparency, you are demonstrating your commitment to act on any issues that have been uncovered. Also, by sharing the results quickly, you demonstrate a willingness to be responsive to the needs of engaged employees. Some may assume that the natural next step upon sharing results is to act on the information by evaluating options, developing a plan and then going to work. This misses an essential step that you need to address, however. Empower your employees and managers to act on the results. This is most effective when managers and employees work together to create solutions. Employee disengagement happens for different reasons in different groups, so it’s important to regularly survey employees to prevent disengagement and identify the means to create engaged employees. Each group must receive survey results specific to their group because what impacts people in sales may have little bearing on the challenges faced by the finance team. Invite employees to join with managers to help craft the solutions. Often it's important to pair employees with managers other than their own as some of the most common engagement issues center on the relationship between managers and their reporting employees. Regardless, empower employees and managers to craft solutions together. Once the previous steps are complete, an organization will do far more damage than good if it fails to act on the results. Not acting hurts credibility, reduces trust, and engenders disloyalty in employees who have had their hopes raised only to then feel ignored. Accordingly, when the results come in and employees and managers are empowered to act together, take immediate steps to implement the feedback. This shows employees that their comments are important to the organization and that the company is committed to active improvements. 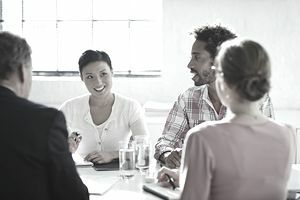 Some of the feedback that comes in will require further discussion or long-term planning, but some feedback can be implemented quickly to provide an early win for managers and employees. When issues arise that have longer horizons, continued transparency is important to let employees know that you are making progress and a plan to address issues is in development. In instances where an organization is unable to act on employee feedback, communicate clearly with employees to let them know why a decision was made, what alternatives were considered, and what additional options are available. If you want to create engaged employees, it’s not enough to just run an employee engagement survey once every year or two. Think of all of the change that occurs in an organization during that length of time. It’s important to let employees know that you intend to do engagement surveys and associated pulse surveys on a consistent basis. This acknowledges your commitment to listening to your employees and helping them become engaged employees. Many top companies run annual employee engagement surveys that take a comprehensive look at employees' relationships with the organization. They then do a variety of pulse surveys throughout the year to measure the impact of engagement efforts as new processes or programs are instituted. The important factor is to make employee engagement and quick pulse surveys a central part of the organization’s continuous improvement process. Engaged employees are essential to any organization’s ability to attain success over time. Given the damage actively disengaged employees can cause, it’s important for organizations to proactively encourage engaged employees. The good news is that preventing employee disengagement is possible. As they say, an ounce of prevention is worth a pound of cure. You can create engaged employees through regular, consistent employee feedback. It's a small investment that will yield enormous dividends.